One of the country's most prominent social media personality and Pro-Duterte blogger Thinking Pinoy or RJ Nieto in real life made a report on the updates regarding the recent arrest of Bayan Muna Representative Satur Ocampo and ACT-Teachers partylist Representative France Castro. 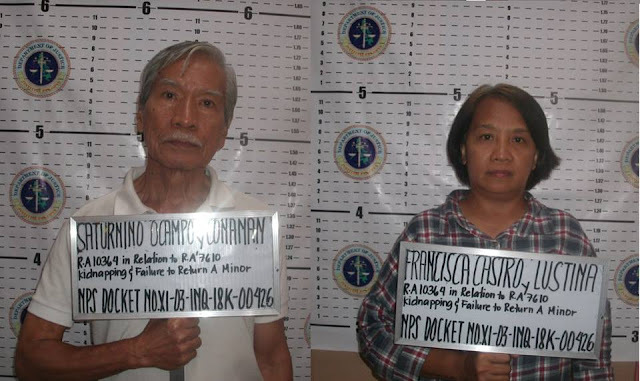 According Thinking Pinoy former Congressman Satur Ocampo and Rep. France Castro were arrested in Davao del Norte on November 29 for alleged kidnapping, human trafficking, and child abuse. The two leftist representatives were caught in a Police checkpoint in Talaingod town with 14 minors. A video footage was also released on social media showing a face-off at a Police station between Satur Ocampo's camp and children's guardians surfaced a day later showing the facts that the NGO's coordinatig with Bayan Muna and ACT-Teachers were not welcomed by the Lumads in the area. According to the 73-year-old Bae Pilar Libayao, the municipal tribal chieftain of Talaingod, complained that Ocampo's camp didn't ask for permission from the tribal council before they took the children. She also pleaded to the leftists to stop using the Lumad. As we all know, BAYAN MUNA Partylist Rep. Satur Ocampo, Act Teachers Party-List Rep. France Castro, and 16 other leftists were arrested in Davao del Norte on 29 Nov 2018 for alleged kidnapping, human trafficking, and child abuse, after they were caught in a police checkpoint in Talaingod town with 14 minors. Video footage showing a face-off at a police station between Ocampo's camp and the children's guardians surfaced a day later. Ocampo and Castro were there to witness the event and are clearly seen in the video clip. The footage shows 73-year old Bae Pilar Libayao, the municipal tribal chieftain of Talaingod, complaining that Ocampo's camp didn't ask for permission from the tribal council before they took the children. She pleaded to the leftists to stop using the Lumad. "While it's good that you visit the mountains and support the Lumad, do not take away our children. Do not evacuate them when there's no war in the mountains. Why did you take them?" she said in Cebuano. She added, "If NGOs didn't come here, there would have been no wars in the mountains." Leftists non-government organizations (NGOs) typically go to the mountains to help Lumad, though several camps, especially those aligned with the government, claim these NGOs indoctrinate children with anti-government and pro-Communist propaganda. Libayao added, "I tell you, I've lived for 73 years in the mountains but there have never been wars." "We have been living there (in the mountains) peacefully and now you take our children away and there's a declaration of tribal war again in the plains," she said. She added, "There are radio advertisements... Lumad dance to get support from abroad... We know that, we know you're selling our tribe." "It's only when you (NGOs) came that there had been violent conflict... Soldiers won't come over if the other side didn't arrive first," she added. The video showed a young woman belonging to Ocampo's camp responding to the Lumad guardian's complaint. The woman said in a mix of Tagalog and Cebuano, "We didn't contact (the guardians) because it was the teachers who asked for the kids' rescue. We spoke to the governor, the mayor, and government agencies, and asked for permission before this happened." She said the request was very urgent so her group weren't able to wait for government officials to reply toher group's text messages. She added that a pastor was even with them to ensure that the kids will be safe from harm. Datu Andigao Agay responded to Ocampo's group. He said in Cebuano, "If you want to take the teacher away then take her, but don't take the kids. We do not want teachers who come from your group." "First off, you killed one of our kids... a college student. You even kill datus (tribal leaders). Every time you come to the mountains, wars happen because you kill the datus. We do not want you anymore," he said. The Agay then focused his attention on the pastor. "And you, Pastor, if you're really are a Man of God, then don't join the ranks of evil men," he said. Addressing Ocampo's entire group, the father said, "We are not afraid to die because you're already killing us!"